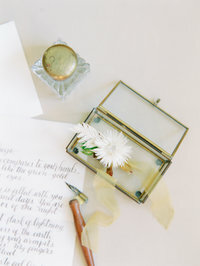 This gorgeous Coastal Bridal Shoot in Malibu California was inspired by incorporating the talents and aspirations that a person has into the shoot itself. Natalie is a very talented artist and we used her amazing sketch as a centerpiece for the shoot. Combining this inspiration with a love of nature, this beach shoot came to life with amazing colors and movement. How could you not love this shot that has both beauty and a wonderful marriage of talent and artistry attached. To top it all of with the amazing accent of hellebores cascading down her back turned this boudoir bridal shoot into an absolute dream. This amazing shoot was featured in Joy Wed, which is a carefully curated, fine art Canadian wedding journal, focused on providing brides with the most awe-inspiring inspiration and talented industry vendors. This is beautiful! The details are stunning, I especially love the bouquet! These photos are so dreamy! Beautiful! This entire shoot is lovely! 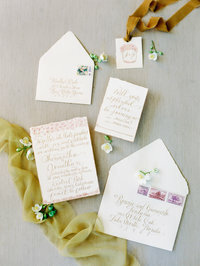 The broken sea glass invitation suite is everything!